So Birmingham's announcement should be great news for road safety, particularly with regard to children as they are less able to cope with moving vehicles than adults. But it will only work with sensible infrastructure design and occasional enforcement, and that's where things are likely to go awry in the UK. Birmingham City council still believes in pinch-points and speed cushions. Birmingham's pinch-points are typical of those in the UK. 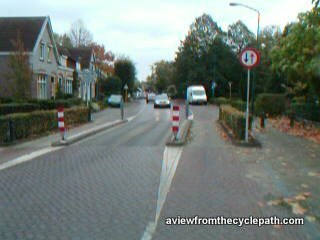 They are not a narrowed section of carriageway with a priority flow direction and cycle bypass as depicted in the Netherlands by David Hembrow (below left), but a tiny island in the middle of the road that has no effect whatsoever on speed (below right*). A Google image search for the the right-hand photo showed that other cyclists are blogging about these, and no wonder. Many motorists race cyclists into the gap, which as can be seen from the photo is too small for both a bike and a car. Usually the cyclist comes off worst, though John Bennett from PushBikes reports seeing one motorist rip the sump off his car by driving over one (http://www.pushbikes.org.uk/). As you might imagine, as a pedestrian I try to avoid stopping on one of the islands, even though that is how they are intended to be used. By the way, for the benefit of people who do not know, those bollards are just free-standing plastic boxes. They do indeed reduce the chance of the driver being injured, but they offer no protection at all to any pedestrian on the island. Speed cushions are also problematic. Drivers of small cars hate them, whilst drivers of large vehicles get to sail across them without slowing down. 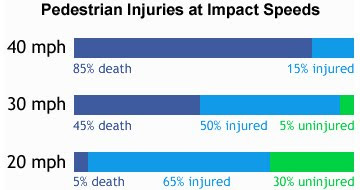 For cyclists and pedestrians they are a menace because they cause those drivers who cannot simply drive over the top to concentrate on the speed cushion rather than other road users. The police (as an organisation) have proved stubbornly resistant to being brought into the 21st century with regard to speeding. Before the police commissioner elections last year I contacted all the candidates and asked about enforcement of 20mph zones. The person who was ultimately elected for this area (Bob Jones, the Labour candidate) didn't even bother to acknowledge my communication, let alone answer my question. For the record, by far and away the best response was from the independent candidate, Mike Rumble. Ironically, he's an ex-police officer.